There’s no Flash Fridays today because I was on the road in Dallas delivering the Batom Comics covers to Heritage Auctions. The covers are to be auctioned off on November 17 for the benefit of the Lisa’s Legacy Fund for Cancer Research and Education. If you want to take a look at some of them, check out the Gallery section on this site. 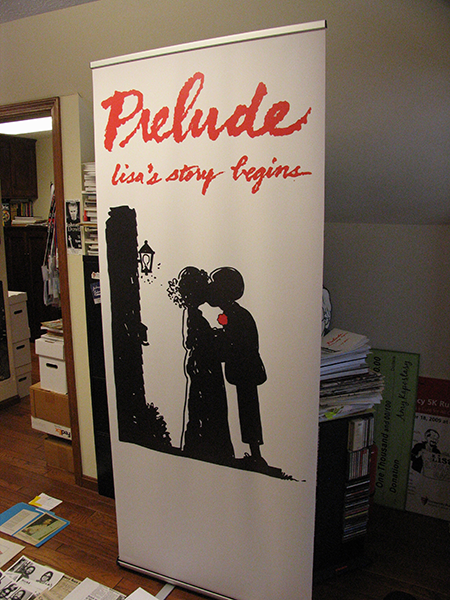 In the meantime, here’s sneak peek at something new in the studio. Where to begin? After nearly a decade of cultivating a bright young audience of readers steeped in the belief that science and technology were the salvation of the future and encouraging those readers to buy into the conceit that their heroes were men and women struggling to use their knowledge and power to make things better in a real world, Julie Schwartz and Gardner Fox decided to drive the book right off the dock and deliver a cold splash of water in the face to all of the acolytes they had inspired. To those loyal followers who had come to expect scientific (even if stretched to the breaking point) premises and solutions… they now served up vapid fantasy. To those who had come to expect a certain seriousness… the creative team now paraded silliness across the page. And to those loyal readers who had bought into the rules that the architects themselves had originally laid out… they thoughtlessly threw all of the rules out the window. It’s a miracle that a whole subset of baby boomers didn’t all have a stroke at the same time. Talk about blood on your hands. It’s hard to describe the feelings you had opening this book for the first time. To start with, the art (while not the source of the problem) was different. 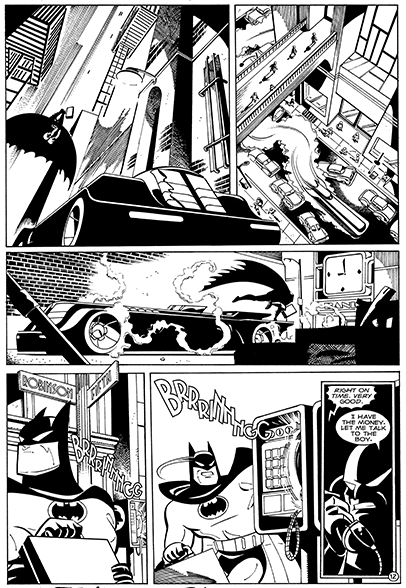 Inker Joe Giella had moved over to Batman with Carmine Infantino and had been replace by Sid Greene. As I recall, Greene did pretty much the same thing on Green Lantern and the Atom as well obviously owing to the fact that, with Julie now off of Mystery in Space and Strange Adventures, he had some time on his hands and an editor who needed a ton of inking done. No problem there because Greene was an elegant and distinctive inker. The problem as I said earlier was that it was different and different is an anathema to the hidebound loyalists who read comic books. But as I said, the art wasn’t the problem. 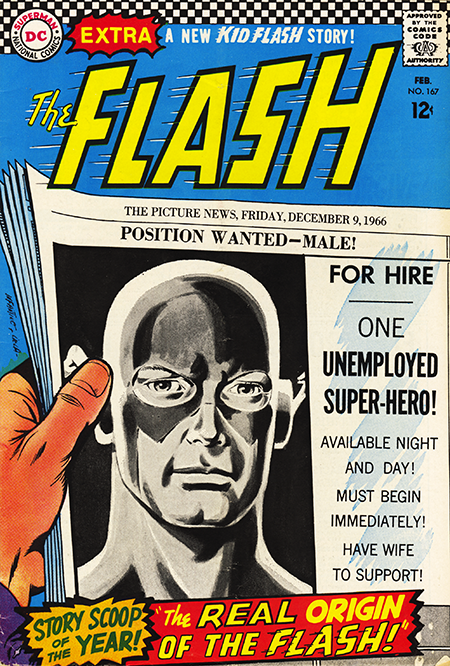 The problem was that Gardner Fox had tossed the quasi scientific story of the lightning smashing the shelf of chemicals as the explanation for how the Flash acquired his super speed, and replaced it with a story about it coming about as an initiation rite for a heavenly helpmate named Mopee. Yes, you read that right… a heavenly helpmate. So now we suddenly have the heavenly powers decide that a man of Earth should receive super speed and they dispatch a gnome initiate tenth class, Mopee, to Earth to make that happen as a part of his initiation rite. Mopee causes the lightning strike in the police lab to give Barry Allen super speed, and then discovers that it won’t last because Barry didn’t own the chemicals that drenched him. So the Flash has to go out and raise money to buy the chemicals himself, thus justifying the silly cover. If all of this sounds a little nuts, you have a glimmer of how it felt to encounter it back in the day.